Would you make a good pipefitter? Take our career test to find out how you match with this and over 800 other careers. What is the workplace of a Pipefitter like? A pipefitter, also known as a steamfitter, is a tradesperson trained in organizing, assembling, creating and maintaining mechanical piping systems that must withstand high pressure. These types of systems are usually industrial, include heating and cooling systems, and involve work with steam, ventilation, hydraulics, chemicals, and fuel. This occupation is often overlooked and sometimes confused with the occupation of a plumber. However, a steamfitter and a plumber differ in the fact that plumbers work with low-pressure piping systems, such as utility systems. Pipefitters work more in welding, rather than in the field of water or water sanitation. Steamfitters work with metals such as carbon and stainless steel, as well as other alloy metals. These metals are shaped through welding and bending to fit specifications for industrial use. Fitters are involved in the process from planning to installation, and will work with tools such as levels, grinders, dies, and welding torches. A steamfitter will typically create a sketch or a blueprint of a pipe installation, or be called upon to interpret existing blueprints. During this process, the fitter is also responsible for selecting the type and size of the pipe, as well as determining other related materials and equipment that are required for the project. From there, the fitter will manipulate metal to form the pipes according to specifications. When the pipes are ready, the fitter will transport them on location and install them. The installation is very important and workers must take care to avoid obstructions and also interference with work currently going on in the building. After installation is complete, several tests are performed to check for any leaks, support issues, and performance against high-pressure environments. Adjustments are made to ensure the system will run smoothly until the next maintenance, which is usually performed by a steamfitter. They can also be called upon to repair existing systems or replace pipes as needed. Are you suited to be a pipefitter? Pipefitters have distinct personalities. They tend to be realistic individuals, which means they’re independent, stable, persistent, genuine, practical, and thrifty. They like tasks that are tactile, physical, athletic, or mechanical. Some of them are also conventional, meaning they’re conscientious and conservative. Does this sound like you? Take our free career test to find out if becoming a pipefitter is right for you. Employment for pipefitters can include utility companies, gas plants, hospitals, chemical plants, oil refineries, building companies, heating and air ventilation companies, and construction firms. Work is done both indoors and outdoors, depending on the project itself. 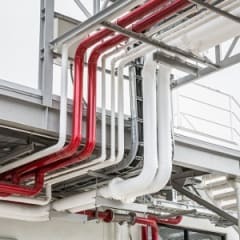 Pipefitters may spend some time at the installation location but will spend far more time manipulating and creating the pipes than working at the actual installation location. There is a risk of injury in this occupation, as fitters work with power tools and heavy equipment frequently. Working conditions may vary, but this occupation involves a lot of standing and sometimes working in tight quarters for long periods of time. There is also occasional exposure to potentially harmful gases. In this situation, workers are asked to wear a respirator or mask. Work hours are often extended beyond typical office hours, calling for as long as a 12-hour workday period. Pipefitters often receive emergency calls because the systems that they work with are often essential for a building to properly function.